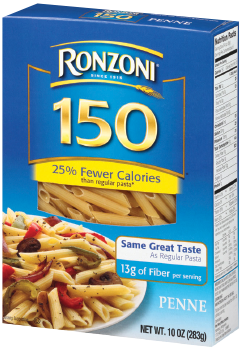 With fewer calories and fiber to help you feel fuller longer, Ronzoni 150® pasta is a satisfying meal for the whole family. Made from a special blend of wheat flour and extra fiber, Ronzoni 150® is available in two delicious shapes: penne and thin spaghetti. Available in 10 oz. * Calorie content has been reduced from 200 to 150 calories per serving. SEMOLINA (WHEAT), DURUM FLOUR (WHEAT), MODIFIED WHEAT STARCH, WHEAT GLUTEN, NIACIN, FERROUS SULFATE (IRON), THIAMIN MONONITRATE, RIBOFLAVIN, FOLIC ACID.